After a fair night’s sleep, I had a surprise wake up call from Lindsay (my financial advisor) who wanted to touch base one last time before I became totally incapacitated with ‘vacation brain’. Then I called Carolyn (my 2nd “mommy”) to say goodbye one more time. Went online to read mail, blogs & boards while internet was still ‘free’. Checked out of the Crowne Plaza; & was driven to the ship at 11 am. I was in the first group to board; so only had to wait about 30 mins. I saw several Passenger faces that I recognized; but don’t know their names. I made a few new acquaintances during the wait. And I got a quick hug from my friend, Peggy (xrvlcruiser), who I met on the Symphony last year. 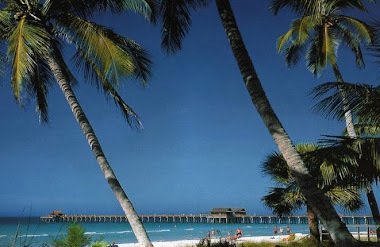 She is ‘in transit’ & on the pier to bring an LA friend onboard today. First smiling face I saw when I boarded was Ed, who was manning the elevator button. And when I got off the elevator, the next face I saw was Benjamin’s. I wasn’t sure he was still here (he’s been talking retirement the last few years). And he still calls me ‘Miss Beekee’. Got to speak briefly with Gary Hunter & give him a big hug before he left to start his 3 month vacation. He is the Cruise Director I am most familiar with; but he handed the baton over to Rick Spath today. 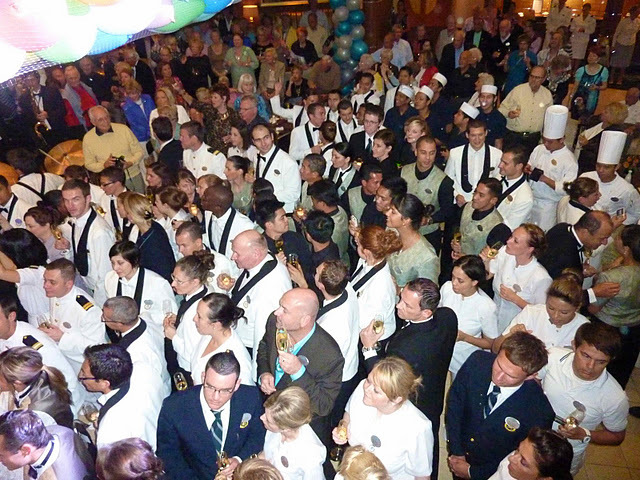 The Crystal Cove atrium was festively decorated for tonight’s sailaway party. There was a different feeling in the air; this wasn’t just your every day, normal sailaway. This is the start of the World Cruise. Not that I will be here for the duration; but being able to be here for 2 of the 3 months is quite a privilege. After a lovely lady relieved me of my very heavy carryon bag full of electronic paraphernalia, I made my way to the Crystal Dining Room for lunch. Since I’m no fan of champagne, I passed on the flutes they were passing around. But I did enjoy the luscious California Cobb Salad, which is my ritual on embarkation day. And as if the Gods were smiling down on me, there on the dessert menu……..lychee sorbet. My one big obsession on Crystal (well…...one of them anyway). Taking care of the usual boarding duties, I visited the maître d’, Leo, to make a few requests. Since I am in ‘decompression mode’, I thought it was best to switch from my assigned dining table to ‘anytime dining’. Since I may not eat in the D.R. that much during this segment, I felt it was best not to leave an empty chair at my assigned table. With this arrangement, I can go to the D.R. when I wish (at any time); & be seated at a table that has empty places. This choice has its advantages & disadvantages. You may not build up a rapport with your fellow diners like you normally would, & you may not even enjoy their company; but you have the opportunity to meet a lot more people. I also requested that they send the dinner menus to my cabin every morning. That way I can decide whether I want to order en suite or make a reservation in one of the alternative restaurants. Next stop was at the Computer University @ Sea; nice to see Jessie still in charge there & Jackie proudly showing off photos of her (3) yr. old daughter Cassie. She tells me that Clarke (her significant other) is on vacation; but will return when we arrive in Singapore. I told Jackie I was thinking down the road to maybe getting an iMac some day; & asked if it might help me to decide if I were to take some of their Mac classes. She said it would; & signed me up for a series of classes that start next week. I also gave her my camera memory card in hopes that she might be able to magically retrieve that photo of Vitaliy (my chauffer) from the supposed deleted files. She’s gonna try. Even though my carryon bag had been stowed for me, my tote bag (which was also heavily laden with ‘stuff’) was beginning to make my ‘frozen’ shoulder worse. So, I thought I’d check to see if the cabin was ready at 2pm; & it was. Can I tell you how good it feels to walk in & see my 2 pieces of luggage that left Naples 2 weeks ago, waiting for me? I did a good bit of unpacking in the next hour. At 3:30 the USC Trojan marching band was coming onboard to get this party started by the Seahorse Pool. They played a wide range of music; & their high energy performance got everybody in the groove. Catching up with my good buddy, Dennis during sailaway festivities. Lifeboat drill started at 4:15; my station met in the Hollywood Theatre. I don’t think it was my imagination; but this drill seemed to go into greater detail than I’ve heard in the past. The Captain spoke at length about smoking & fire hazards; the ability to lower life boats even if the ship was listing; & advising us to go straight to our stations if we weren’t near our cabins in an emergency situation. Assuring us that there are plenty of vests throughout the ship if we can’t bring ‘our own’. I also noticed that everyone was clearly paying attention & taking this very seriously. The tragedy onboard Costa Concordia was a wakeup call! 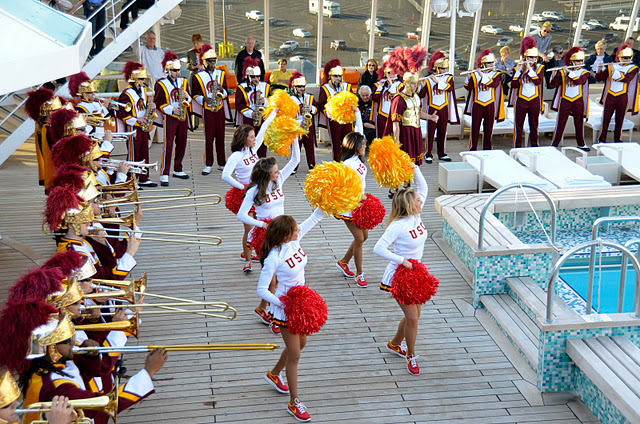 Afterwards I went up to the promenade deck to watch the Trojan band play on the upper concourse of the pier. Our departure was delayed about half an hour while we waited for an extra tugboat; so the Golden Princess (which was docked in front of us) left first. The sun was starting to set; the band was really putting on a show & you could see the ‘dancing waters’ show that takes place hourly in front of the World Cruise Center here in San Pedro. The Trojans were still playing when we pushed away from the pier. What a great night it was turning out to be. I went back to continue my unpacking; & soon my darling Indian cabin stewardess, Elizabeth, rang the bell to introduce herself; & ask if I needed anything. Since I’m making this my home for a while, I like things a certain way; & Crystal prefers that you ask for whatever pleases you. So, I gave Elizabeth my wish list: 2 therapeutic contoured pillows (take all the rest away); take away the duvet & the blanket (leaving me with 2 sheets & a throw over the foot of the bed); store my 2 huge suitcases (somewhere else); cover the leather sofa with a cooler bed sheet; stock the fridge w/ bottled water, Sprite & diet Dr. Pepper (take everything else away); my fruit basket would be fine with one pear & a few grapes every day; told her I would be ordering quite a few meals from the D.R. menu to have delivered to the cabin; & that I’m not that picky about how my room is serviced. I told her there would days when I didn’t care if the cabin was vacuumed or the beds made. As long as this didn’t get her in trouble with her supervisor, I sometimes prefer the quiet & privacy of just ‘existing’ in my cabin. And that could mean 2 naps a day….so why bother? There are probably some of you who are rolling your eyes right now; & saying ‘wow, she’s a demanding be-yotch’! That’s why it’s different on Crystal. They EXPECT you to tell them what it’s gonna take to make your stay the happiest moments of your life. I could easily have taken extra sheets; & put them over that leather sofa myself or hidden all those extra pillows in the top of the closet. But then they would have ‘reprimanded’ me for not telling them that that’s the way I wanted it in the first place. Whether it’s caviar every night at dinner (no extra charge); if you want your ice bucket refilled 4 times a day; or you have a yearning for some strange curry dish from Bangladesh, they WANT you to ask!!! I’ve never heard the word ‘NO’; I’ve never seen a smirk or a roll of the eyes. Yes, I’m a walking billboard for all things Crystal…..it’s what past passengers refer to as becoming ‘Crystalized’! I’ll step down from the soap box now. Another thing that struck me, was watching people’s faces light up when they saw old friends for the first time. It’s normal to break out in a grin when you board & see your favorite crew members year after year. But I don’t remember EVER seeing such a huge number of reunion moments between passengers before. I’ve seen it on a much smaller scale on other cruise lines. I’ve cruised with about 7-8 of these other passengers before; but it looked like everybody knew everybody else! Maybe it’s a world cruiser thing…..an elite club of sorts. I’ve heard some people on the Cruise Critic message boards mention how they felt like 2nd class citizens when they were sailing on just one or 2 segments of the full world cruise. I certainly don’t feel that way myself; but I do see it’s a ‘family unit’ within itself. This evening was undoubtedly the most interesting people watching session I’ve ever experienced. At 8:15, Rick Spath (the Cruise Director) took the stage & introduced Elise Ivy (W.C. Hostess), Josef Lumetsberger (Hotel Director) & finally Glenn Edvardsen (the Captain). Then a large contingent of the crew from all departments made an entrance down the grand staircase & took their places on the dance floor. They were given glasses of champagne as well. Credit to Keith (KESWORLD), who got this shot from a different perspective. The countdown began; & balloons came cascading down from the ceiling onto the dance floor. You would have thought it was New Year’s Eve all over again. Machines were blowing confetti in every conceivable shape & color down on the crowd. Some fell down the front of my low cut top; a piece stuck in my eyelashes; & I had a silver star sticking out of the top of my hair when I looked in the mirror later. When I got back to my cabin, it hit me how tired I was. The ganglion cyst on my left foot was throbbing; & my right hip & knee were aching mightily from all the stair climbing & walking I’ve done the past 2 days (I’m such a mess). I was (almost) too tired to eat. I gave Elizabeth my dinner order; & in the short time it took to shower, she returned & set everything out on the coffee table (which rises to dining height). For my appetizer I had thinly shaved Parma ham, topped with baby spinach, matchstick pear & goat cheese. It was an outstanding mix of flavors! This was followed by king crab bisque topped with melted brie (tasted more ‘fishy’ than I’d expected). My entrée was a chicken breast stuffed with crab meat drizzled with rosemary sauce; grilled marinated artichoke hearts & a simply divine garlic & chive polenta. I know it’s terrible to eat & go to bed; but I couldn’t stay vertical another minute longer. Two Advil PM & I was in bed by 10:30. Didn’t fall right asleep; but I was just happy as a clam to be back at sea & being gently rocked into oblivion! Loving this........you are so very complete in your explanations of your wonderful cruise moments. In a way, I wish I was with you! Have fun my sweet Becky! Em: You've been blogging for four days. I've gained four pounds! Coincidence???!! !